The Hungarian folder pays homage to the “fejesgörbe” (“header curved”), the traditional pocketknife of Hungary. Designed by Hungarian architect and knife enthusiast Gábor Szakonyi, this beautiful knife faithfully captures the graceful lines of his country’s classic folding knife, as well as the spirit of quality that typifies all Hungarian folk art. An exceptional synthesis of traditional artistry and state-of-the-art manufacturing technology, this beautifully crafted knife features Walker LinerLock construction, full stainless steel liners, sculpted stainless steel bolsters, polished G-10 scales, and a full-flat-ground CTS XHP blade. 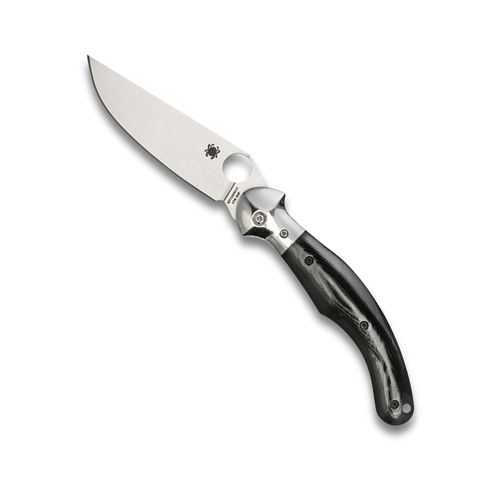 In true Spyderco fashion, it also offers a Trademark Round Hole in the blade for one-handed opening and a pocket clip for convenient right-side, tip-up carry.